With the convening of the 17th Party Congress this autumn, leadership succession at the ministerial and provincial level is back in the spotlight. By the end of 2006, 14 provinces have completed their leadership succession, and 17 others are expected to complete theirs by the first half of this year. The new round of succession highlights relatively young people, especially those born in the 1960s, who are well educated and possess the required skills. The Organization Department of the Central Committee of the Communist Party of China (CPC) has also designated the proportion of different age groups in the provincial leadership. Specifically, among members of the standing committee of a provincial party commission, there should be at least three members younger than 50 years old, and at least one about 45. According to statistics by the Organization Department, among the members of the reshuffled standing committees of 14 provincial CPC commissions last year, 56 of them were under 50 years old, and 21 of them an average of 45. A number of these high ranking officials at the provincial and ministerial level were born in the 1960s. 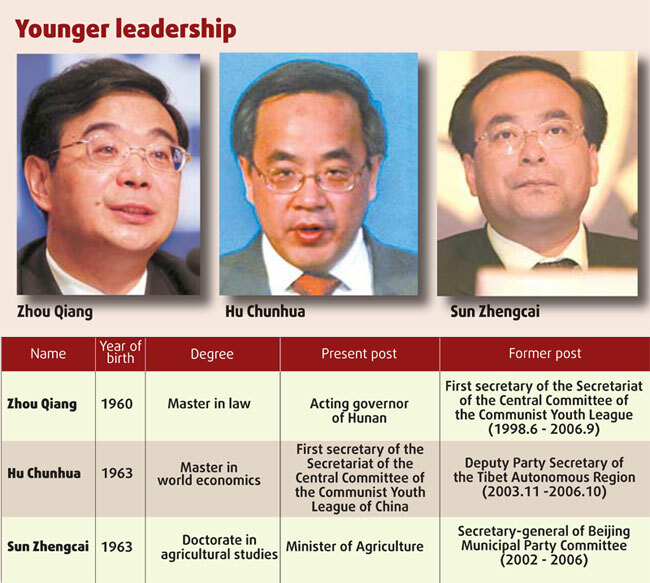 The 1960s group includes the 46-year-old Acting Governor of Hunan Zhou Qiang, the 44-year-old First Secretary of the Secretariat of the Central Committee of the Communist Youth League of China (CYLC) Hu Chunhua, and the 45-yea-old minister of the Ministry of Agriculture Sun Zhengcai. Zhou is the country's youngest provincial governor so far. Wang Wei, professor with the National School of Administration, said: "They were born and raised during the 'cultural revolution' (1966-76). They were educated in an era when knowledge, both science and humanity, was strongly promoted; and they were the first group to grow up together with the country's opening up and reform policy." Wang, who tutored young officials, said they have a broad vision, and expertise in social administration. And according to Xu Xianglin, professor with the School of Government, Peking University, another reason behind the emergence of so many young officials is due to the country's determination to cultivate them in the 1980s. Xu said the then leadership made the decision, after foreseeing the trend of social development, and the disadvantages of elderly officials who tended to be too conservative.